The Mayan Time Science describes energy changes in Cosmic history and is our most valuable tool for charting the future. Carl Johan Calleman has a Ph.D.in Physical Biology from the University of Stockholm and is cited around 1500 times in the scientific literature proper. He has been a Senior Researcher of Environmental Health at the University of Washington in Seattle and served as a cancer expert for the WHO. With his Solving the Greatest Mystery of Our Time: The Mayan Calendar (Garev 2001) he initiated the evidence-based study of the Mayan calendar, which was followed by The Mayan Calendar and the Transformation of Consciousness (Bear and Co, 2004) and the forthcoming The Purposeful Universe (Bear and Co, December 2009). The forthcoming book for the first time describes the physical reality of the Tree of Life and presents the first complete alternative to Darwinism in 150 years. His web page is www.calleman.com . Since the abovementioned debate two different intellectual cultures have emerged around the two possible end dates, one based on belief (December 21, 2012) and one based on evidence (October 28, 2011). These two cultures are about as different from one another as any one of them is from that using the Gregorian calendar. The proposal of the December 21, 2012 date is based on the unproven belief that the precessional cycle actually means something for human evolution, and, amazingly, as far as I know no one advocating this end date seems to have even bothered to try to prove this basic assumption. In contrast, the October 28, 2011 date is based on massive scientific evidence that the Nine Underworlds and Thirteen Heavens known from ancient Mayan sources indeed describe cosmic evolution in all of its aspects. Moreover, while there is extensive evidence that the Maya based prophecy and prediction on shifts between baktuns, katuns, tuns etc, not a single ancient Mayan text mentions the 26,000 year precessional cycle. Since those advocating the December 21, 2012 end date do not identify shift points in the Mayan calendar leading up to their end date their hypothesis is however not testable from the predictions made, which is the hallmark of any serious scientific theory. Hence, it must be qualified as belief rather than science. Based on nothing more than belief a culture has subsequently emerged around the December 21, 2012 date, since it serves as an ideal projection screen for fantasies, fears and hopes rather than something that can be proven and understood scientifically based on the patterns of the Mayan calendar. The October 28, 2011 end date can however be rationally understood. It has also been verified by several predictions, most recently my own that an economic collapse would set in and when it would do so: Regardless of what forms such a [financial] collapse may take it seems that the best bet is for it to occur close to the time that the Fifth NIGHT begins, in November 2007 [strictly speaking the 19th] (The Mayan Calendar and the Transformation of Consciousness, page 233). In accordance with this prediction economists now agree that it began in December of 2007, see Figure 1). This prediction was actually formulated already in my first book in English, Solving the Greatest Mystery of Our Time: The Mayan Calendar written in 1999 and published in 2001 (page 187). This is really a direct parallel to Edgar Cayce’s famous prediction of the time for the New York stock exchange crash, in this case however made about ten years in advance, and so was made much earlier than any professional economist even considered such an economic meltdown. I however do not claim to have some unusual psychic abilities, and instead this prediction attests to the fact that with the right end date, October 28, 2011 the mystery of the Mayan calendar has been exactly solved. That these predictions were accurate can be verified by anyone, who cares to examine the relevant pages in my books. In contrast no one who claimed that the end date of the Mayan calendar is December 21, 2012 made any similar prediction and can mostly not credit themselves with having made one single accurate prediction based on the Mayan calendar. Already this should be a red flag for anyone looking for a way to understand the evolution of civilization based on the Mayan calendar. Before going into the more practical consequences of adhering to the evidence-based or a belief-based interpretation of the Mayan calendar I however think that it is necessary to discuss the nature of time and what it is that makes the Mayan calendar special. It is in other words important to know whether we have any reason to concern ourselves with the Mayan calendar in the first place. Why is it that unlike all other calendars the Mayan calendar has an end date? The answer to this is that the Mayan calendar expresses an entirely different kind of time than other calendars. Most calendars, such as the Gregorian, Muslim, Buddhist or Jewish calendars, are based on astronomical cycles and reflect continuous time. They describe measurable mechanic time, the aspect of time that the Greek would call Chronos, which is also the only one that is recognized in the modern world. Since astronomical cycles, whether they are cycles of the moon, the earth or the precessional cycle, will continue over the next billions of years or so there is however no reason that calendars based on them should ever come to an end. Since the Mayan calendar however has an end date this must obviously be based on another type of time than mechanical time and its end date must be discussed against the background of consciousness-based time – what the Greek would call Kairos and so we must ask what could be the origin of this. If we go back to ancient sources to find out information about the origin of the Mayan Long Count they never say that this would be based on any astronomical cycle1. Instead, the Mayan sources, for instance at the Temple of the Inscriptions in Palenque, explicitly say that the Long Count is based on the World Tree or what other cultures usually refer to as the Tree of Life. As I will be describing in my forthcoming book The Purposeful Universe (Inner Traditions, December 2009) Mayan time is in fact quantized and describes different quantum states of the Cosmic Tree of Life. It is always against the background of such quantum shifts in time, and not continuously flowing astronomical cycles, we may understanding the defining moments of our lives, but also of human civilizations. The Cosmic Tree of Life at the center of our universe behind these quantum shifts was discovered by modern science only in 2003. Yet, the fact that it is real, and not a mere symbol or myth, calls for a revolution in how we view our whole existence. It affects not only science, but also how we understand religious prophecies, which often include references to the Tree of Life. Hence, for instance the Book of Revelation refers to this and it seems to be returning to our awareness in the nick of time. Since the Mayan calendar originates in the Tree of Life not only every day, but also every katun, baktun, pictun etc is associated with a symbol, such as a day-sign and a number, symbolic of its different quantum states. These states are then creating the geological and historical eras of cosmic evolution, which the Maya would refer to as ages. Many people are expecting a quantum shift as the Mayan calendar comes to an end – and rightly so – but a continuous astronomical cycle by definition never gives rise to quantum shifts. The reason the Mayan calendar is able to explain so many quantum jumps in the fossil record and paradigm shifts in the history of mankind (which is far from slow and continuous) is the very fact that unlike other calendars it is quantized. The understanding of Mayan time as quantized also provides a meaningful way of looking at the so-called end date where it is not even potentially a preset end of the world. (This is why no one embracing the October 28, 2011 date has fallen to claim that it is a preset end of the world). The end date simply reflects the point in time when the Cosmic Tree of Life attains its highest quantum state. This also implies that it is not the beginning of a new cycle and it is only on this basis that it is rationally understandable that this state would serve to create a millennium of peace in the “New Jerusalem” as the new world is called in the Book of Revelation. To instead use a Hindu metaphor it becomes logical that the attainment of this highest state means liberation from the wheels (cycles) of Karma. As the student of the evidence-based Mayan calendar will know almost all conflicts and warfare in the history of mankind actually originate in quantum shifts between cosmic energies and only as those come to an end is there any serious reason to hope for the emergence of a world in harmony. Hence, in this interpretation of the Mayan calendar there is absolutely no reason to think that the end date means the end of life or a “doomsday” when the world is predetermined to come to an end. What the end date does mean however is that on October 28, 2011 the shifts between energies will come to an end and it is thus no wonder that many intuitively sense that the year that follow upon this, 2012, is very special. The processes that have been driving cosmic evolution until now will no longer be operating and after some time for things to settle the human beings will be left to create evolution themselves. What this means is in my view that the end date is not just another shift. Instead it constitutes the end of the shifts that have been caused by alternations in the quantum states of the Tree of Life up until that point, exemplified by the abovementioned quantum shift that led to the decline of the economy as the fifth NIGHT began. Such a vision of a new Garden of Eden (albeit on a higher level) obviously lacks any rational basis among those advocating that we look upon the Mayan calendar as based on mechanical astronomical cycles, where a new cycle will then begin. To understand the liberation of mankind and a future return to the Garden of Eden however simply mandates quantized time. This illustrates an important principle, namely that even if the evidence-based Mayan calendar is not difficult to understand, it is not trivial. It is not something that you can thoughtlessly put in your old box of thinking. The Mayan calendar is fundamentally different from all other calendar and how and why that is is something that needs to be deeply honored and respected. From this perspective, where we are approaching the end of cyclical changes and the highest quantum state of the universe, it is also logical that the economic meltdown that we are now in is not merely a “recession” or a “depression”, such as we know to have been precipitated in the past by NIGHTS in the calendar. The decline is instead the beginning of the end to the cycles of the economy. Yet, since we know from the study of the Mayan calendar that the time periods when the economy shrinks are the NIGHTS we can make some predictions as to how this end of the economic cycles is going to play out. The first pulse of bringing the growth economy down thus came with the fifth NIGHT and led to a rapid decrease in growth, a fall in stock values, and increases of lay-offs and foreclosures. 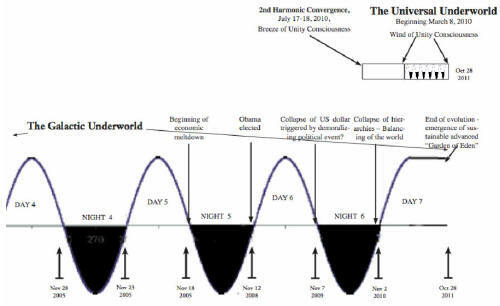 We are currently in a period in between such NIGHTS, the sixth DAY (see Figure 2), when the same processes are continuing more slowly and may even temporarily be slightly reversed. Around the time that the Sixth NIGHT begins on November 8, 2009 we may however expect that the meltdown intensifies and the US dollar collapses and with it the established monetary system in the world. Many things may trigger such an event, but it is important to understand that whatever triggers it, and this may be some kind of political event, it is the energy of this NIGHT that will bring it about. This incidentally, is also why it is so important what will be made of the rebirth energy of the second half of the sixth DAY. We can only imagine what such a collapse will mean, but I feel it is clear to everyone that the consequences for our every day lives will be very far-reaching. Because of the hardships many may come to lose faith in this Creation or think that we are being punished. I look upon it differently: The consciousness of the Galactic Underworld is already preplanned to set in a protective mechanism for the planet by first stopping the growth, which is what any cancer doctor would do before any healing could take place.2 As the reader may now realize we have come to a point where the discussion of the end date of the Mayan calendar is a critical issue since how we relate to the future will directly depend on it. This is neither academic hairsplitting nor irresponsible New Age fantasies. Those that advocate the evidence-based Mayan end date of October 28, 2011 may in fact advice people to prepare themselves for this further economic meltdown beforehand in the sixth NIGHT. Those that talk about December 21, 2012 are however, consistently with their logic, likely to continue to make projections on this fantasy screen in the future. What these people in effect are saying to people is “Do not prepare yourself for the New World now! Wait until the shift comes December 21, 2012!” since they do not recognize any quantum shifts before this point in time. To know the exact end date is then a matter of paramount importance to people, because it is their only way of knowing what quantum shift they are experiencing in the present moment. While many people advocating the December 21, 2012 date are simply jumping on a bandwagon to create some visibility for themselves (and sell various products) I feel it is time that they consider what kind of responsibility this implies also for other people. It is probably not an accident that the first major Hollywood movie, surely planned to confuse people about the Mayan calendar and tout the December 21, 2012 date is scheduled to be released in November of 2009 as the sixth NIGHT begins. The ruling media will then use the December 21 2012 date to manipulate the truth and of course there are always some that are willing to play along. It is quite easy to see in whose interest it is that the Mayan calendar in this way is projected to a time in the future when all alignment with it will be too late. As the established international monetary system collapses in the sixth NIGHT things can go essentially in either of two directions. It will go either in the direction of a grass roots organization of a new economy without banks, interests or growth serving to create a world without dominance. A collapse of the international monetary system, especially if it is linked to a moratorium of all debts, holds the potential of paving the way to a world that is truly egalitarian, based on willful cooperation and where greed will not destroy the world. This of course precludes the existence of a banking and monetary system organized in the interest of a minority and driven by the craving for abstract values rather than human needs. I think however that it would be naïve to think that such an implementation of a New World according to the cosmic plan would happen without resistance. Some want to hold onto power over others. To many more the downfall of the established order of dominance would be shocking because it would ruin their experience of security in a world that they have become accustomed to. The bankers, governments, medias and ruling establishments world wide will then naturally seek to set up a new single global currency and remain in control, which they are very well prepared for. This especially the case if people are unaware of the evidence-based Mayan calendar and are able to see this difficult period as part of a process designed to lead to a new world. I am however convinced that the upcoming Universal Underworld will bring a new unity consciousness carrying a bliss of just being and love and compassion for all things just the way they are. Thus, things may not become “better” in the sense they were spoken of in the old economy, but life will be more enjoyable because of a new level of consciousness in which things are perceived in another way. Thus, in the years ahead we are in for a confusing mixture of seemingly conflicting developments. A critical aspect of preparation for this is the knowledge that the evidence-based Mayan calendar ends October 28, 2011, which at least gives people a benchmark for the rhythms with which things will evolve even though it will take a certain time for things to settle also after this. The vision that is emerging for the time ahead is thus neither that “the world is going to an end,” nor that “we will all be happily flying” at a certain preset date in the future. Instead, we see a fairly complex scenario based on the best evidence that we have for an understanding of the future. It has much in common with the difficult birth scenario for the “New Jerusalem” as this is presented in the Book of Revelation. As this book points out this is however not a world for everyone and it is a scenario that almost certainly will require spiritual strength and integrity to endure. I do not want to add any religious overtones to this discussion, but it seems clear that everyone who is aspiring to enter this new world must sincerely seek the truth and avoid simplistic explanations. Even if the Mayan calendar thus is universal and fundamentally connected to the Book of Revelation it is nonetheless important to know how the contemporary Maya see their end date. Naturally, some of them are happy that their calendar has received worldwide attention and may just believe what the archeologists have been telling them, which is December 21, 2012 (The actual Long Count upon which this date is based went out of use among the Maya a long time ago and so this date has been forwarded to them by modern archeologists). But more authoritative sources such as Don Alejandro Oxlaj of the Council of Elders are not just jumping on the bandwagon. As anyone who has seen the interview I made with him two years ago (available on DVD from Mayan Majix) he rejects the December 21, 2012 date as a miscalculation (Something that at the time was actually a surprise to me). He also carries the prophecy of the Thirteen Baktuns and 13 Ahau, consistent with the October 28, 2011 date (which is 13 Ahau). Unlike myself he however does not specify an end date, even though we do agree that the last katun shift (beginning of the last 7200 day prophetic period) took place in 1992. Around this katun shift at February 10, 1992 we can also very clearly see that major events, a quantum shift, shaping the whole world took place: The end of the Cold War and the collapse of the Soviet Union (December 25, 1991), the institution of the European Union, (February 7, 1992) and the launching of the World Wide Web (August 1991). By the time of the katun shift advocated by the December 21, 2012 people (John Jenkins says April 1993 in the “Doomsday” documentary on History Channel) the new world was thus already established. Also in the future the people embracing this end date will thus always be in the backwater of what is really happening in the world. This demonstrates the utmost importance of the end date and that those who want to be consciously part of the coming quantum shifts ahead and surf on the waves of creation that these generate will miss that opportunity if they reject the evidence based Mayan calendar with its end date of October 28, 2011. If you ignore the evidence and listen to the December 21, 2012 “alignment”3 prophets this is likely to have very serious direct consequences for your own life and how you approach the future. With the acceleration of time in the Galactic Underworld the difference of 420 days between the two end dates is literally as big as that between day and night. Please post, translate and spread! 1 No ancient Mayan text talks about the meaning of the end date of the Long Count. The beginning of the Long Count is however discussed in different places and a good source for this is Freidel, Schele and Parker, Maya Cosmos, pages 59-122, The Hearth and the Tree. A very good source for understanding how the political life of the ancient Maya was dominated by non-astronomical time cycles is Prudence Rice, Maya Political Science. Those interested in how their prophecies were based on non-astronomical cycles may study the katun-prophecies in the Books of Chilam Balam. 2 Personally I do not believe that there is a God who intervenes in Creation to change its course (This would imply that creation would not be perfect to begin with). The way it works is that the Galactic Underworld favors the right brain half to the detriment of the left brain half that is mediating abstract values and it is thus that we now see a collapse of abstract values such as digits in bank computers and paper bills. In an interview with Larry King a few months ago Bill Clinton stated that a third of the wealth of the world had been wiped out in the past year. This is an excellent example of thinking in terms of abstract values. In reality no real value had been wiped out. What had been wiped out were a third of the figures in the bank computers. This collapse of abstract values has still far from bottomed out. 3 This so called alignment actually happened in 1998, but this is very rarely presented since it would be of no interest to the media now selling the “2012 phenomenon”.